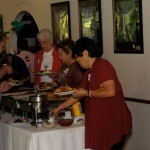 In the March 2017 issue of the E-Newsletter we informed our members of the relationship of our chapter to our parent 442nd Veterans Club and the decision to form a non-profit Sons & Daughters organization in the event the Veterans Club was to fold and the chapter would also cease as an organization. This is a short summary of some key events since March. 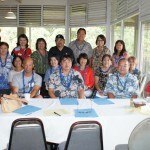 First, after communications sent to all S&D members via email; two telephone conferences; and discussions at the April and May monthly meetings, the S&D chapter formed a separate, non-profit organization with the same name (only with the addition of “Inc.”) by adopting bylaws for the organization, filing articles of incorporation with the State of Hawaii, and applying for tax-exempt status to the Internal Revenue Service (IRS). Tax-exempt status has since been granted by the IRS to our organization via letter dated June 2, 2017. Second, the 442nd Veterans Club is still in existence, with a potential substantial change to come. 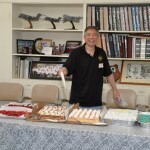 By a vote at a special meeting called by the Board of Directors of the Club on June 26, 2017, the Club members, by majority vote, approved the transfer of substantially all or part of its assets and liabilities to the 442nd Legacy Center, subject to the approval of the Board of Directors of the 442nd Legacy Center. As noted in the March E-Newsletter, the sole purpose of the Legacy Center is to plan and build (and operate) a legacy center dedicated to the 442nd RCT. Third, the S&D chapter had requested in writing a postponement of the Veterans Club June 26, 2017 special meeting and vote for various reasons, including questioning the limited information provided to Veterans Club members prior to the special meeting and vote as well as to provide time to ensure that all eligible Club members were contacted, including eligible S&D members who inherited Club membership from their 442nd fathers. The special meeting was not postponed and the vote resulted in approval of the transfer of the Veterans Club’s assets and liabilities. 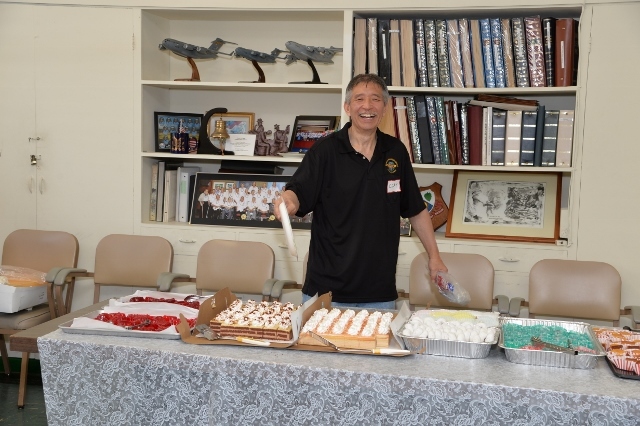 Fourth and in summary, the S&D chapter and non-profit organization will continue to support the 442nd Veterans Club and the 442nd Legacy Center. It is our fathers who were the 442nd RCT. We can do no less. Other sections of this E-Newsletter will feature a few of the activities the S&D are currently engaged in to uphold the 442nd RCT legacy. The Sons & Daughters of the 442nd Regimental Combat Team was established as a chapter under the 442nd Veterans Club of Honolulu in May 1993. Nearly 25 years have gone by and our chapter is thriving, still supporting our beloved Veterans. 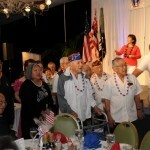 But with each passing year the number of Veterans dwindles; all too soon they will be gone. 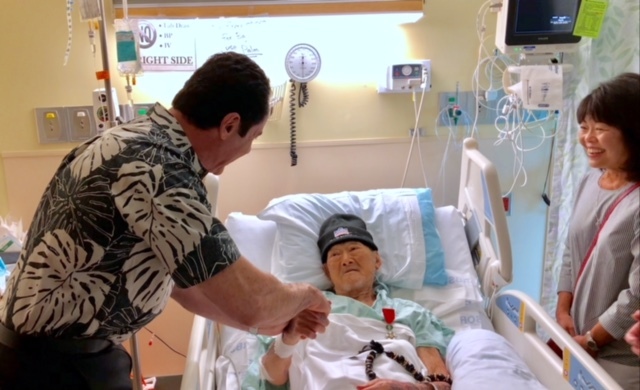 But their valor and sacrifices must not fade — and herein lies the future for the 442nd Sons & Daughters – assuring the enduring legacy of the men of the 442nd Regimental Combat Team. In the last two years the leadership of the Veterans Club has put into place a plan to transition to the coming era when Taps and a rifle volley have saluted the calling home of the last Veteran. Under this plan the Veterans Club has formed a new organization, the 442nd RCT Legacy Center, and announced that the 442nd Veterans Club will be retired and cease to exist. When this happens, all the chapters of the 442nd Veterans Club will also cease to exist, which includes our Sons & Daughters chapter. But we each know in our heart and soul that the end of our current organization does not diminish, does not end, our responsibility, our obligation, our kuleana to keep the memory of our fathers, grandfathers, uncles . . . our ancestors, their legendary valor and valiant sacrifices shining bright, a beacon for the generations to come. So after much discussion in the last few monthly meetings, we determined in February to work toward transitioning our Sons & Daughters chapter into an independent nonprofit Hawaii corporation. 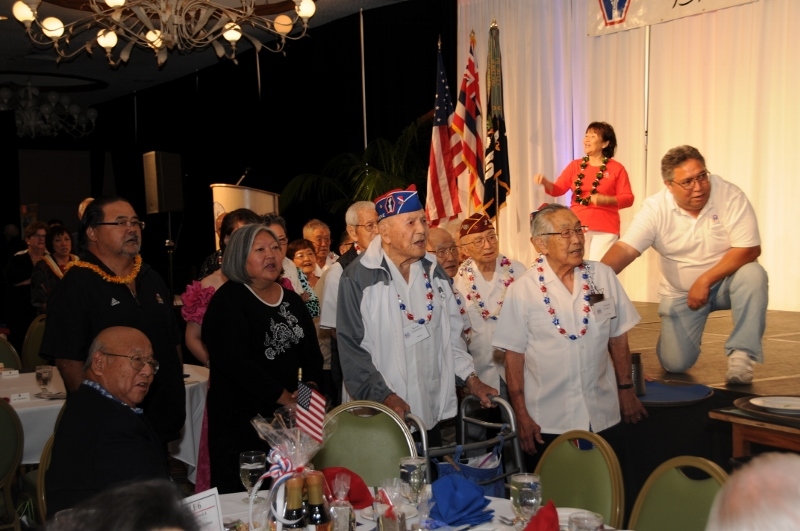 We will not disappear with the end of the 442nd Veterans Club, but will be reborn with the mission to preserve, perpetuate, and share the legacy of the men who served in the 442nd Regimental Combat Team in World War II and forever changed our lives for the better – Okage Sama De. Very soon we will be sending the proposed Bylaws of our new organization to the S&D members for review and a vote, the specifics of which are in final preparation. Please keep up with this important matter via this e-newsletter and the S&D emails we will be sending to the members. 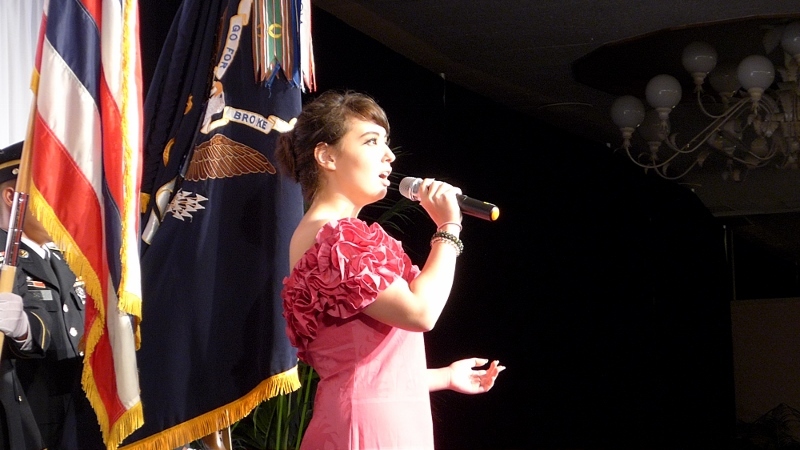 Ms. Angelee Marshall, a Kahuku High and Intermediate School 7th grader (Oahu), contacted the S&D of the 442 RCT chapter to request information on the regiment with a questionnaire for her History Day documentary entry. 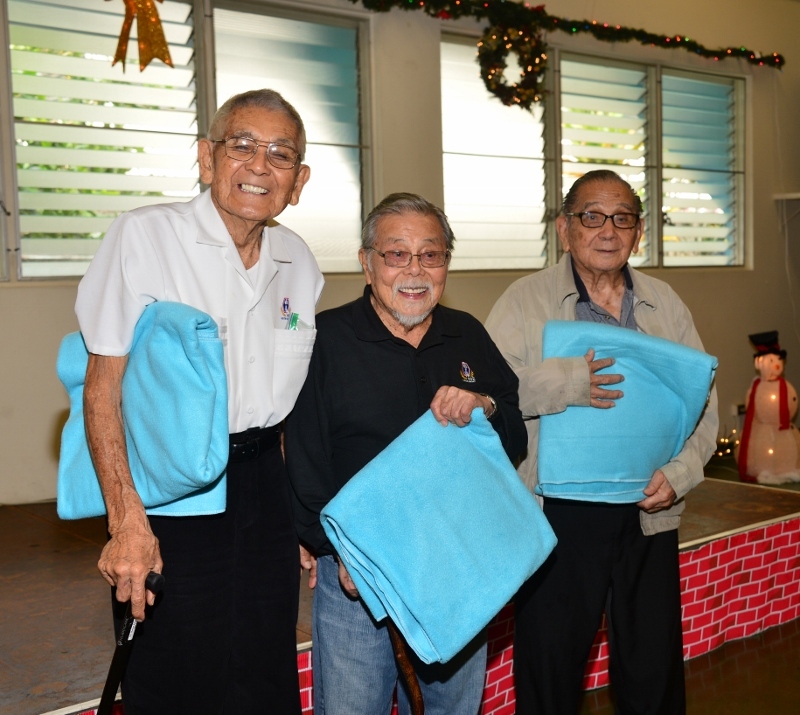 The request was shared with the 442nd Veterans Club members. We are grateful for Angelee’s contribution to the annual National History Day competition and to veteran Mr. Kenji Ego and others for submitting their answers to her questionnaire. Here is a link to Angelee’s draft video, which she said she will be editing to correct some errors, https://vimeo.com/205118187. 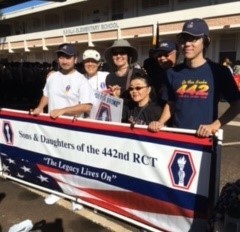 On November 11, 2016 a group of Sons & Daughters of the 442nd RCT members and others community members marched with a group of descendants from the 100th Infantry Battalion Veterans (Rural Chapter) in the annual Veterans Day Parade in Wahiawa. Friday, November 11, 2016 was a bright and sunny day, resulting in our umbrellas being unnecessary and left in our cars. Sun screen, hats and dark glasses were more in order for the day. About a dozen members of the Sons and Daughters chapter walked in the annual Veterans Day parade up California Avenue, the main drag in the former plantation town of Wahiawa. 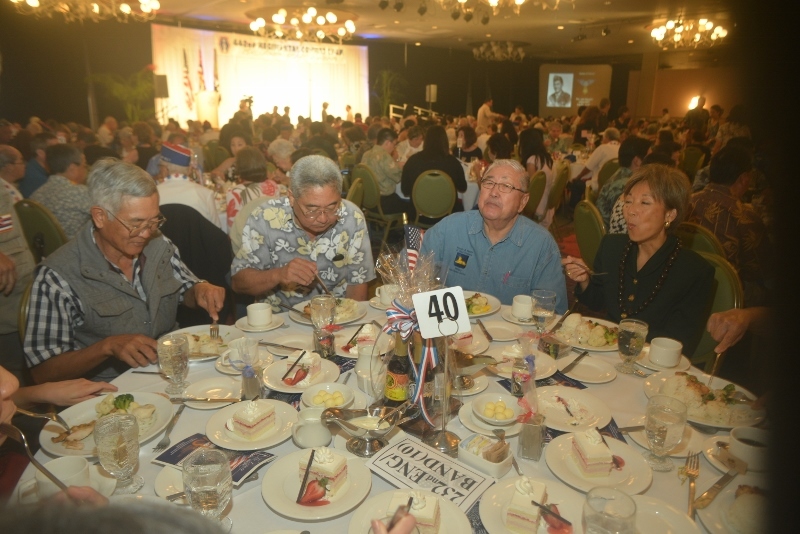 We joined a group of descendants from the 100th Infantry Battalion Veterans (Rural Chapter) at the invitation of president Stephen Saito, the Yonsei grandson of a Nisei veteran, Masaharu “Bull” Saito. 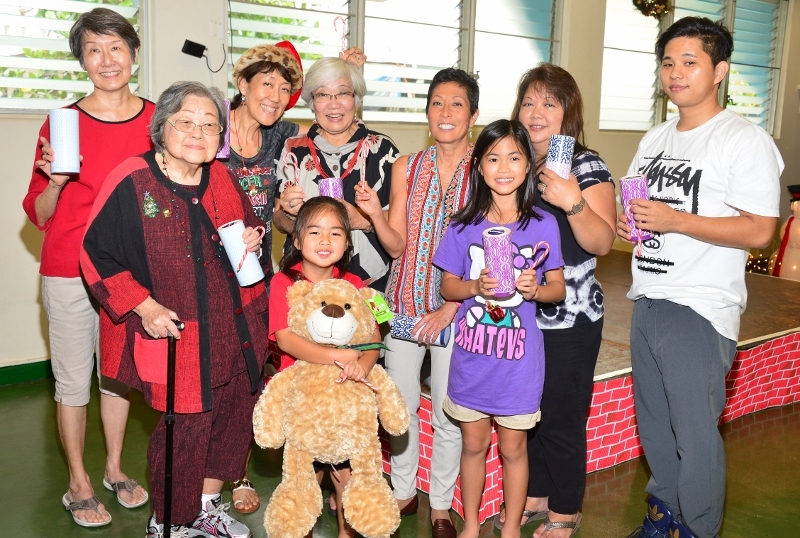 The Sons & Daughters group was coordinated by Grace Fujii, S&D Chapter President, and consisted of Bill Wright, Juanita Wright Allen, Laura Hirayama, Anita Nihei, her son Gavin and his friend Brant, Susan Yoshitomi, Laughlin Tanaka, Gail Nishimura and Byrnes Yamashita. Jeannie Ishikawa stopped by just before the start of the parade to say hello and to give us encouragement before heading off to march with her Neighborhood Board group. We proudly carried the huge banner of the Sons & Daughters of the 442 RCT and a large poster created by S&D member Ron Takamoto, depicting the famous 442 RCT Liberty Torch with the words “GO FOR BROKE!” The tagline on the banner read “The Legacy Lives On.” Grace had a frame made of PVC pipe which made the banner very easy to carry. Our combined group was given the honor of being the 10th marching group and we gamely fell in line behind the Veterans of Foreign Wars caravan. The parade route was just a little over a mile long and slightly uphill in places. The street was lined with many people who cheered us on in a spirit of patriotism and gratitude for all of the veterans that have served our country over the years. 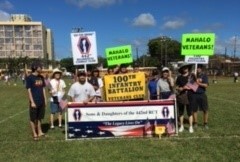 Besides its deep plantation roots, Wahiawa is also strongly influenced by nearby Schofield Barracks and there was a lot of spirited support for the marchers. 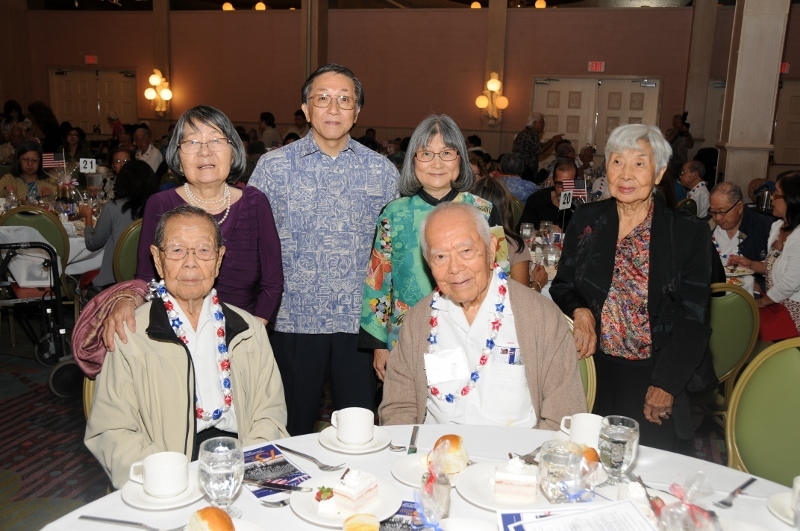 Several members commented on how nice it was to meet the 100th Infantry Battalion descendants and expressed the desire to have more joint activities with them. Stay tuned for news of any upcoming joint activities. 2016 Sons and Daughters Family Christmas Party. 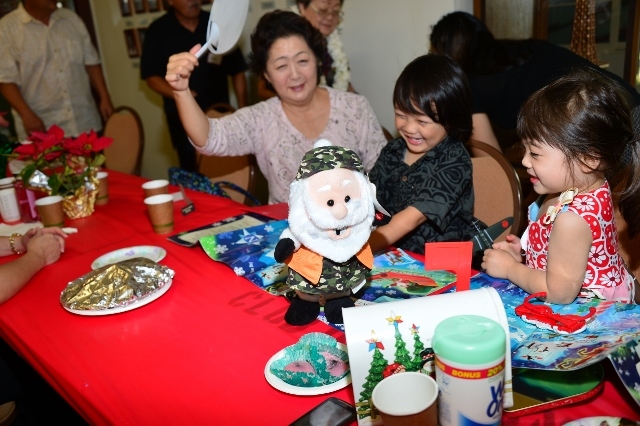 The annual 442nd Sons & Daughters Family Christmas Party was held on Saturday, December 10, 2016 at the 100th Infantry Battalion Clubhouse with the attendance of a little over 100 individuals. 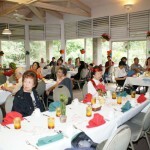 It was an event filled with merriment and memories for all. 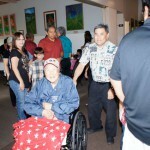 We were honored by the presence of three 442nd RCT veterans – Kenji Ego, Robert Kishinami, and Richard Nomura. 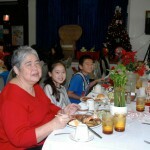 Ann Kabasawa continues to amaze everyone with her organizational skills in chairing this event for the past few decades. 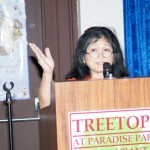 Her dedication and commitment to the organization should be applauded by us all. Lunch included an array of dishes such as tossed salad, fruit salad, a variety of sushi, rice, noodles, spring rolls, curry stew, and sweet sour spareribs. Dessert was on display on another table, with a beautiful Christmas cake centerpiece surrounded by brownies, various kinds of mochi, cupcakes, and other home baked goodies. 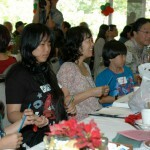 Following lunch, Gail Nishimura treated us with her challenging holiday games. I’m still figuring out whether I needed to pass the candy cane to the right or left? Next year, I need to remember to review my Christmas carols. 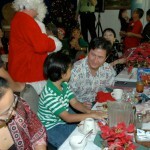 Santa made his grand appearance after the singing of songs with Ed Goto. 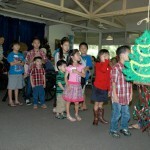 Children were treated to candy sweets and Christmas gifts with a lot of “Ho Ho Hos”! 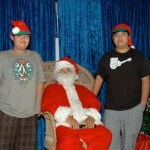 It’s not Christmas without Santa and his elves (AKA Curtis Sakamoto and sons, Jason & Justin). No one went home empty handed. During lunch and following our Santa visit, Ann called out everyone’s name to pick-up a grab bag gift, many generously donated by Carol and Mike Sullivan and much appreciated. 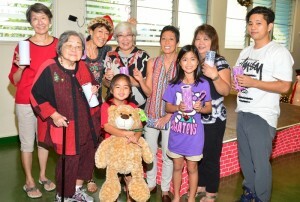 In addition to the grab bag, several lucky people received donated gift cards before the ending of the event. 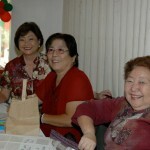 If you want to join in the fun, plan to attend next year’s event. It will be posted on the 442nd Sons & Daughters website sometime in November 2017. 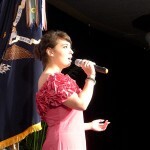 These are candids and a mix of the shots at this year’s banquet. Thank you to all the photographers of the 442 S&D and friends. 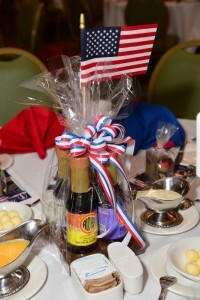 This is the first of series of post with photographs – of a great banquet in honor of our fathers, uncles, grandfathers, heroes. 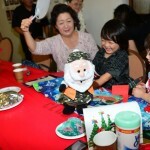 A good time was had at the Family Christmas Party held in December by over a hundred 442 Sons & Daughters, members and their families and friends, including several of our cherished 442 veterans. 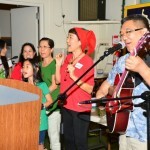 Thank you to Ann Kabasawa for the planning and organizing, her gang of volunteers for setup, cleanup, donations, entertainment, and Santa and helpers. And thank you Sons and Daughters and S&D members and your families for making it a fun event! Hope you enjoy the selection of photos below taken by Clyde and by Pat. The Sons & Daughters Of The 442nd RCT annual Christmas Party was held on December 15, 2013, Sunday morning at the Treetops Restaurant. It was also our last monthly meeting of the year. Sadly, it was our last get together at the Treetops Restaurant as the owner has decided to retire and close the restaurant. 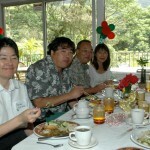 Will miss the ono food that we have enjoyed for years. All who attended had a merry time with fantastic food, creative games, singing Christmas Caroles, and the arrival of Santa for the children! There were prizes galore, everyone went home with a bagful of goodies. 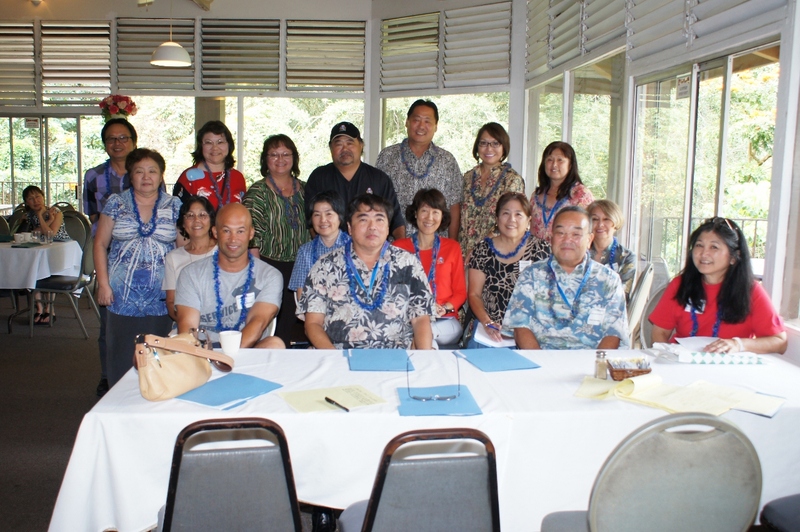 The elections of the 2014 officers was held and we would like to thank the following people for their time and service to the Sons & Daughters of the 442nd RCT: President – Wesley Deguchi, 1st Vice-President – Byrnes Yamashita, 2nd Vice-President – Wade Wasano, Secretary – Susan Yoshitomi, and Treasurer – Shirley Igarashi. Los Angeles – November 25, 2013. Scott Fujita, recently retired from the National Football League, after playing 11 seasons with the Kansas City Chiefs, The New Orleans Saints, the Dallas Cowboys and the Cleveland Browns. 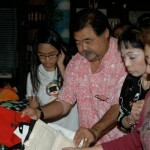 He is the adopted son of Rodney and Helen Fujita of California. His grandfather, Nagao Fujita, was a member of the 442nd RCT. 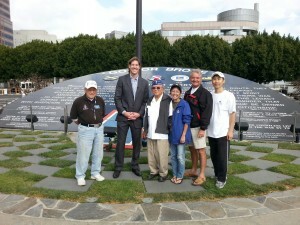 Scott was at the Go For Broke Monument where a Japanese TV station was doing a story about him. 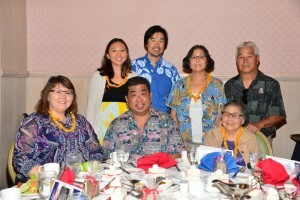 Also there were veterans Hiro Nishikubo and Don Seki, Tracey Matsuyama, Dickie Wilson and Takanori Nishi. Honolulu- 100th Infantry Battalion Clubhouse. 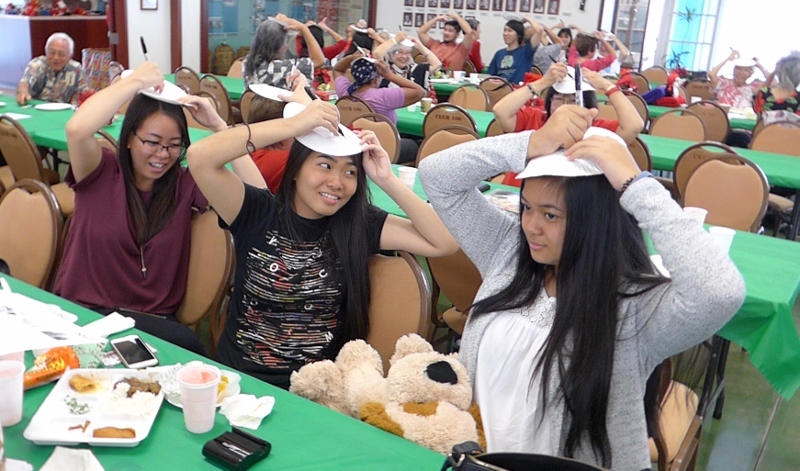 On Saturday, August 31, 2013, the Sons & Daughters of the 442 hosted a dinner and movie night. 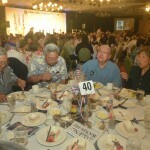 Family and friends of the 100th, 442, MIS and 1399 were invited to attend. 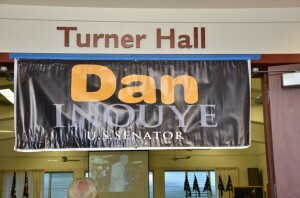 A documentary of the late Senator Inouye, “Journey to Washington”, was the feature presentation. 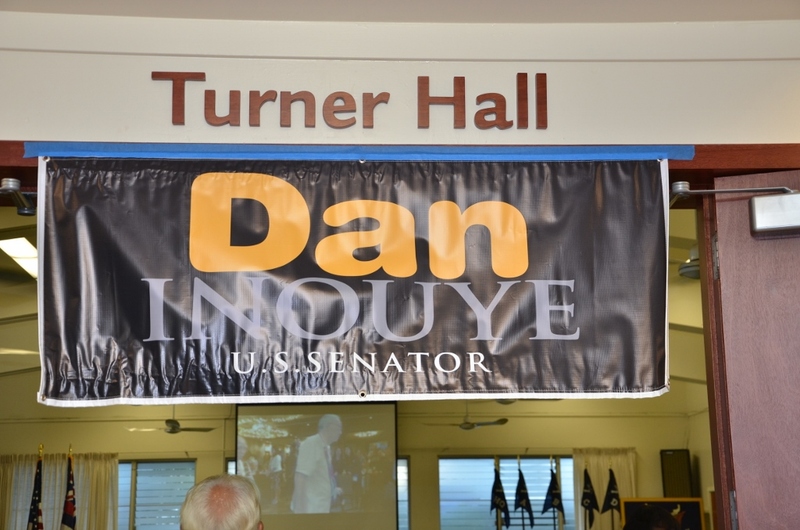 It was a fun filled evening with lots of food and lots of opportunities to meet new and old acquaintances. 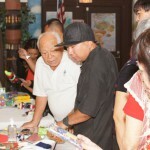 Click below to view photos of the event, compliments of Clyde Sugimoto and Pat Thompson. 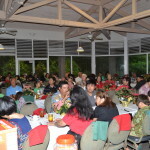 Our annual Sons & Daughters of the 442 RCT Christmas Party was held on December 16, 2012 at the Treetops Restaurant in Manoa Valley. 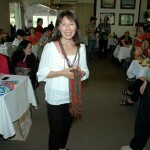 Thanks to our hardworking chairperson, Ann Kabasawa, it was filled with delicious food, fun games, fellowship and door prizes! 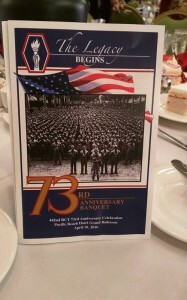 Attending were 442 Veterans and spouses, Sons & Daughters of the 442RCT and their children and grandchildren. A General Membership Meeting was also held for the election of the 2013 officers. Our current officers were re-elected for the 2013 term. 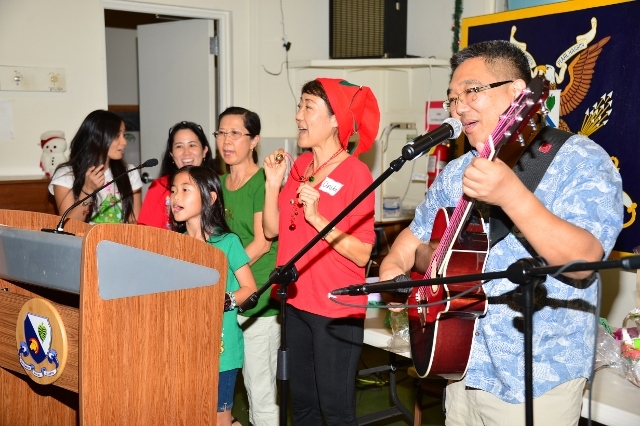 Our thank you to Wes Deguchi (President), Al Sadanaga (1st Vice-Presdient), Wade Wasano (2nd Vice-President), Susan Yoshitomi (Secretary), and Shirley Igarashi (Secretary) for voluntering in their respective positions and meeting the challenges of the coming year. Your time and dedication is appreciated by all. 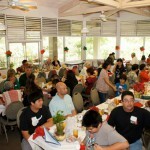 For those who were unable to attend, check out our photos and plan to attend in 1013, the date has been reserved for December 15, 2013 at the Treetops Restaurant in Manoa Valley. 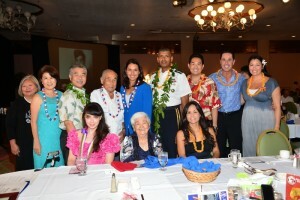 Click below to view photos of the event, courtsey of Clyde Sugimoto.